Does your favourite movie pass the Bechdel test? Are there are least two named female characters in it? Do they discuss anything other than men? It’s pretty shocking to discover that many films can’t pass this simple test! Writing Women is the result of collaboration between Lauren, Evert Houston, and Farah Merani. It was launched in 2012 as a platform to inspire screenwriters to write and develop the very thing most needed in the Canadian film marketplace: stories about women. A two-month development series was created where original short films with focus on female stories would be developed weekly with a group of film industry professionals. The series gives screenwriters the opportunity to hone their craft and improve their work with the help of mentors already working within the Canadian film & television industry. This year during the first four weeks of the series, the mentors came from a writing background and included Stephanie Morgenstern, co-creator of Flashpoint, Amy Cameron of Verite Films, Sonya Di Rienzo of Whizbang films and acclaimed actress, writer and director, Rosemary Dunsmore. The second half of the series was manned by producer mentors including Judy Holm of Markham Street Films Inc., Lori Fischburg (Beauty and the Beast, How (Not) to Become a Vampire), Michelle Latimer of Streel Films and Virgina Thompson of Verite Films. Additionally Ciara Murphy of Pier 21 Films as been the resident dramaturg for the entirety of the series. Sound interesting? Tomorrow (Tuesday, December 3rd), join Lauren, Evert, and Farah at An Evening of Writing Women. Part-showcase and part-fundraiser, the evening will feature live readings of the Writing Women’s 2013 screenplays performed by a knockout cast of professional actors including Deb McGrath, Colin Mochrie and Sheila McCarthy. There will also be a fabulous silent auction, complimentary snacks and a cash bar with drink specials. We love the work Writing Women is doing and we’re looking forward to hearing the screenplays they’ve helped develop–they’re sure to pass the Bechdel Test with flying colours! 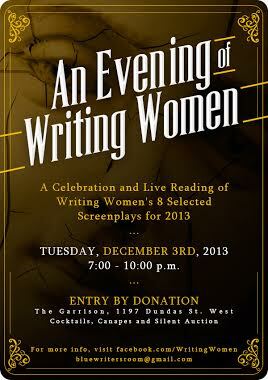 An Evening of Writing Women starts at 7pm at the Garrison (1197 Dundas St. W) on Tuesday, December 3rd. Entry by donation.